LESS-THAN-TRUCKLOAD - Transnet Freight Ltd.
Transnet Freight can accommodate single pallets or consolidate multiple shipments with separate destinations with our Less than Truckload services. 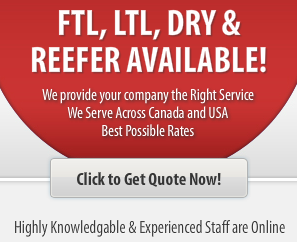 The LTL service is offered within Canada and the United States as well as for cross border shipments. An LTL shipment requires intricate planning, weight management and scheduling, and Transnet has the experience and skill to provide this service. We plan shipping schedules, flag potential problems and recommend solutions early on in order to save you time and money. Transnet makes shipping any type of load easier by offering access to experienced and approachable staff along with an online tracking service that allow you to be in the know every step of the way. Please contact one of our representatives today!